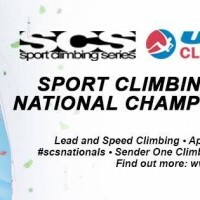 Tune in later today at 5 PM PDT for live coverage from Santa Ana, CA of the qualifying round of the 2014 Sport Climbing Series National Championships. Sources close to me tell me that we may have a special guest to kick off the broadcast. We’ll be looking for your feedback throughout the broadcast either in the chat on Youtube or via the hastag #scsnationals on Twitter. You can see who is competing by clicking this link for the men and this link for the women.